Gardening can be a pretty interesting hobby for some, as you get to see the labor of your hands literally bear fruit in due time, although for folks like me who do not have an inkling of what a green finger is like, it can be rather “deadly” for whatever plants that go through my doors. Having said that, apart from making sure that the plants in the house get an adequate amount of sunlight, you would also do well to ensure that they have enough water. In order to ease your watering woes in your rather extensive garden, how about giving the $39.99 3-in-1 Portable Sprinkler System a go? This is one Portable Sprinkler System that is capable of watering your entire yard at one time, unlike other models that we have seen in the past. 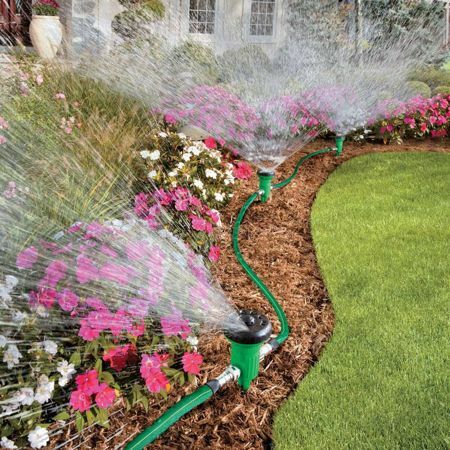 You will be able to enjoy the flexibility of using 3 sprinklers with just one faucet, where it is as simple as attaching your home’s garden hose to the first sprinkler; before hooking up the 6′ lengths of 1/2″ flat garden hose to the other remaining two sprinklers. Once done, simply arrange the Portable Sprinkler System in order to have it match your yard shape, where it can cover up to 950 sq. ft. of real estate. Choose from 10 spray patterns: center shower, spinning, circle, half circle, ring shower, rectangle, center strip, strip, wedge and half-wedge and get the job done in double quick time.